We are manufactrer of All engineering models. It's a Trubo Jet Engine model. It seems beautiful. it's painted fully powder coating. Aeolus Aero Tech Pvt. Ltd.
Rangsons Schuster Technology Pvt. 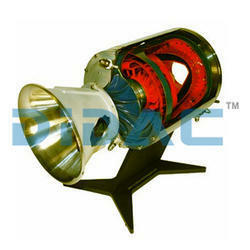 Ltd.
Adour Engine is a bypass Jet Engine of modular construction. The Adour has two-stage low pressure and five-stage high pressure axial flow Compressors which are driven by separate, single stage high pressure and low pressure Turbines connected through co-axial shafts, with low pressure shaft passing through high pressure shaft. Almost all airline companies' maintain / store engines in standby for quick replacement. The engines are very expensive and are usually needed in emergencies, in case of engine failures. - Centrifugal high pressure pump. - Compact rotary I.C. engine. Backed by a rich industrial experience, we are engaged in bringing forth a comprehensive variety of Aircraft Jet Engine. Sky Rider Aviation Pvt. Ltd.